Have you ever wondered if you're at risk of hereditary illness? Ever wondered if your diet is not only fuelling disease processes but also preventing you from making progress with your fitness goals? I'm also sure that if you're reading this, you're aware that everyone is different and there are reasons why some diets work for one person but can have the complete opposite effect for another. We've all heard the classic lines, 'it's just good genes' or 'they look like that because they have good genetics'. But how true is this? To what extent can understanding your DNA actually affect your nutrition and training? This is where Atlas Biomed comes into play. Atlas Biomed is a personalised health company who provide two at-home tests - DNA and microbiome analysis, which together provide a detailed analysis of your overall wellbeing. The results of the tests are uploaded onto your online account with recommendations on the exercise, diet and lifestyle that may suit you best, all based on the findings from analysing your own DNA and gut flora. You've got all my most detailed information, so how are you keeping it secure?! I was reassured that Atlas Biomed opperates a strict Information Governance Policy, which incorporates the European Data Protection Regulation. All data is encrypted as soon as it is received and is anonymised on the Atlas database. Therefore, only the Atlas servers can read the information. We are the only people that can request access to our own information and can request removal of all of our data from the Atlas server at any point, as stated in the Data Protection Regulation. I completed the tests the day after they were delivered and it took around 8 weeks for the results to come back. I actually found the site quite hard to navigate as there are so many tabs to click on and I found myself missing some info and then re-reading others! Once I actually understood all my results here's a few of the most interesting things I found out..
a) I've been told by consultants to include more salt because of my bp being low..
b) I love salt so would massively struggle to cut it out..! It also stated "avoid HIIT as it can be just as bad for your health as doing no sports at all" - debatable. Yet again, this is one piece of advice I'm not sure I will take BUT it's good to be aware of the 'risk' either way. I don't do a lot of HIIT anymore but I do do some and it's my preferred method of cardio. IMO I think doing one high intensity class a week is more beneficial for my health than doing no cardio at all, especially considering my sedentary job. I was also told I'm at high risk of several other diseases based on close relatives already experiencing them. For these, Atlas Biomed suggested some lifestyle changes. I also really liked the fact that they included a scientific paper with each disease process to reinforce the data and suggestions they were making. In addition to the above, I also found out some pretty cool things. One of them being that I am 24% African?! Um whaaaat?! As if my mix of Indian/Ukrainian wasn't strange enough! 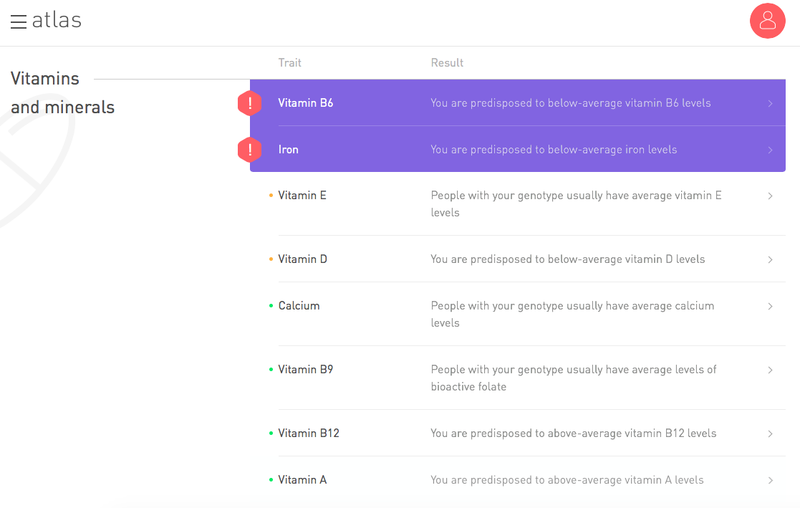 Probably one of the most useful tools was the genetic predisposition to some low vitamin levels as shown in the screen shot below. So clicking on the tab for low levels of B6 for example, it displayed some information about this water soluble vitamin and a scientific paper about how my genetic variant has been linked to low B6 levels. It also gave some suggestions to incorporate foods that are high in B6 such as walnuts, cauliflower, carrots, tomatoes and avocado - all of which I already have almost daily, which is good! One area that I think could be improved was the iron recommendations. There was no mention of the difference between heme and non-heme iron, which I think is particularly important considering I have a predominantly plant based diet. Put simply, non-heme iron is primarily found in plants and most iron supplements. Heme iron is primarily found in meat. Non-heme iron is therefore what I generally consume in the form of legumes, rice, oats, nuts and green leafy veg. It is harder for the body to absorb non-heme iron as it has to be converted first. Therefore, some mention of this to people that are not initially aware of the difference could be much more beneficial. So apparently my microbiome is Danish..! How the heck that evolved from my Indian/Ukrainian/African roots, I have no idea! I also got told my microbiome was that of a 'village peasant' lol. As insulting as that initially sounds, once I read through the literature provided by Atlas Biomed, it turned out to be a good thing! Atlas Biomed gave several suggestions of foods I should incorporate to help build upon the already good colonies of bacteria in my gut. I actually sent off my samples before my transition to a more plant based diet so it would be really interesting to see how these results would compare if I was to take the test again! I would definitely look at repeating the microbiome test in a few months, as particularly with Veganuary coming up, I'd want to check my vitamin and mineral levels along with any change in gut flora after a whole month on a vegan diet!